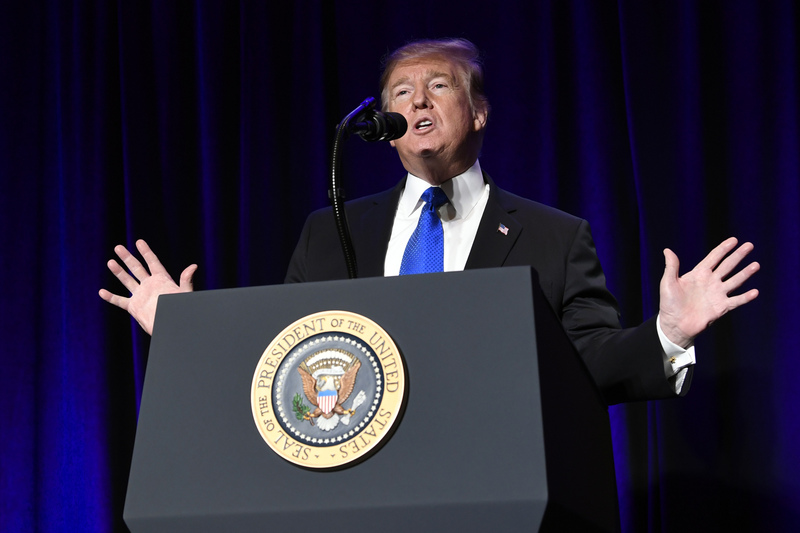 WASHINGTON - President Donald Trump is eyeing a path to avoid another government shutdown where he would reluctantly accept the congressional border-security deal and attempt to tap other funds for his wall. Trump is likely to grudgingly sign the legislation and then immediately use his executive authority to fund additional border measures, said a person who talked to the president Tuesday and asked not to be identified to discuss private conversations. “I don’t want to see a shutdown. 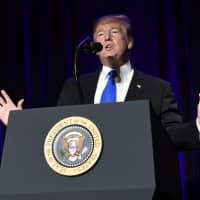 A shutdown would be a terrible thing,” Trump told reporters Wednesday in the Oval Office. But he wouldn’t commit to signing the legislation, saying he would wait until the White House reviews the final version. Trump’s team has concerns on some provisions that may be included in the legislation based on briefings they have received, said a White House official who spoke on condition of anonymity. The official declined to comment on what specific provisions may be problematic. Lawmakers are continuing to haggle over the final details of the legislation — expected to be released late Wednesday or Thursday — while their leaders began lobbying for votes. Partisan fighting over the bill text resulted in delays that mean the House is likely to vote on Thursday. “We are in good shape,” said House Appropriations Chairwoman Nita Lowey, a New York Democrat. Trump suggested in a tweet Tuesday that after getting briefed by the lead Republican negotiator, Sen. Richard Shelby of Alabama, that he could get what he wanted for border wall money elsewhere in the federal budget. “Was just presented the concept and parameters of the Border Security Deal by hard working Senator Richard Shelby. Looking over all aspects knowing that this will be hooked up with lots of money from other sources….” Trump wrote. The president’s campaign for a wall on the U.S.-Mexico border is entering a new phase after his quest to get $5.7 billion in the agreement to keep the government operating fell far short. The tentative accord reached Monday night provides just $1.375 billion for 55 new miles of fencing in Texas. Negotiations on the final legislation were being drawn out by haggling over details. Republicans want to put an extension to the Violence Against Women Act in the spending bill while Democrats are seeking a full reauthorization, according to a Democratic aide familiar with the talks. Democrats are also pushing to include back pay for contractors affected by the last government shutdown and running into objections from the GOP. Border fencing provisions were still also being debated. Lawmakers left it up to staff to resolve a Democratic push to exclude the National Butterfly Center, a SpaceX launchpad and other areas in Texas from fence construction. Rep. Henry Cuellar, a Texas Democrat, said the dispute has been resolved and that he’s been told barriers won’t be allowed in those areas. The legislation would have to pass both chambers of Congress and get the president’s signature before midnight Friday to keep the government open. Congressional Republicans have been pointing Trump to pots of federal money he could tap for his border wall to steer him away from using a politically and legally fraught emergency declaration. One Senate GOP leader, Roy Blunt of Missouri, said he’s already scouring the federal budget for ways Trump could use available funds for a wall that won’t trigger a power struggle with Congress. So far, he says, he’s found at least one solid prospect: a program to combat drug trafficking that has $800 million left in its account. “There are a handful of those places, and if we get to the place where it’s time to talk to the president about those I intend to,” Blunt said. Other sources of money that have been discussed in varying degrees of seriousness include military construction funds, Army Corps of Engineers projects and money forfeited by convicted criminals. Any attempt to shift money is likely to trigger a new round of battles. Senate Minority Leader Chuck Schumer of New York and other Democrats said that Trump would be barred from making transfers without congressional approval under restrictions in the new deal, and the matter could wind up in court. Republican leaders have been delicately trying to forestall any effort by the president to declare a national emergency to get what he wants, despite weeks of threats. They say they have even warned him that enough Republicans could defect to override any veto of an expected resolution against his action if he does so. Senate Majority Leader Mitch McConnell told reporters Tuesday that he wouldn’t be opposed to the president taking lesser action to transfer funds, so long as they pass legal muster. “I think he ought to feel free to use whatever tools he can legally use to enhance his efforts to secure the border,” McConnell, a Kentucky Republican, told reporters. White House Acting Chief of Staff Mick Mulvaney already has made clear he’s looking into options to further aid Trump’s quest for a wall. Under current practice, the chairmen and ranking minority members of each spending panel subcommittee sign off on any reprogramming request. Gordon Gray, a former Senate Republican budget aide who is a fiscal policy specialist at the policy research organization American Action Forum, said the administration is trying to avoid a legal challenge by scouring previous appropriations bills for extra money rather than boldly asserting it has presidential authority to defy Congress. Sam Berger, a specialist on appropriations and administrative law at the Democratic-leaning Center for American Progress, said Congress would have standing to sue the president for tapping those funds for a wall that has nothing to do with protecting the military or disaster mitigation. “Otherwise Trump could simply turn the military into his personal construction company and declare that improving his golf courses was a national emergency. This is not the intent that Congress had for those funds,” he said. The more likely course, Berger said, is using the anti-drug trafficking funds to put up barriers in areas with high levels of drug trafficking. Already some Republicans are telling Trump to be careful of which programs he taps. Armed Services Committee Chairman Jim Inhofe of Oklahoma said he had warned Trump not to touch military construction funds for the wall, but he could live with using Army Corps funds. Gray said it is unclear if Congress would challenge Trump, whether it would have legal standing and whether it could prevail. The legislative branch may decide in the future to end some of the reprogramming discretion it has given the executive, however, if lawmakers feel the discretion has been abused. He said it is more likely that if Trump seizes private land for his wall without congressional authorization he would face legal challenges. “I don’t know that there is any time you tell a Texas rancher that some of their property is no longer theirs that they would simply accept that,” he said.